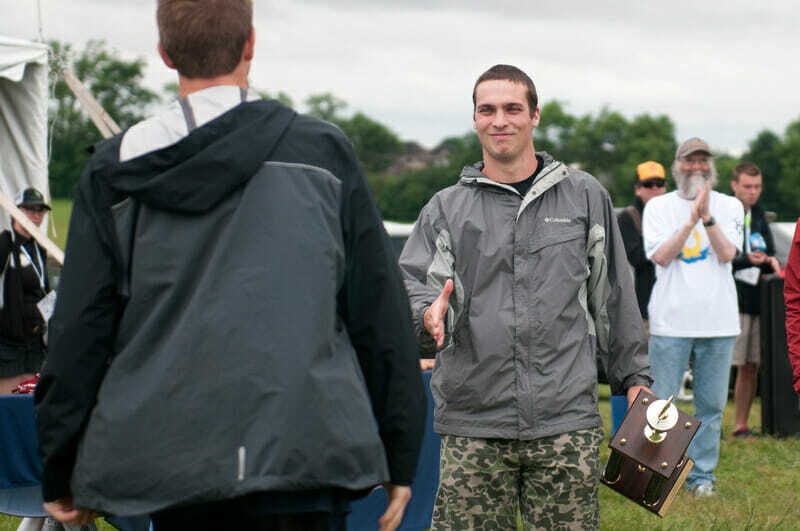 Ultiworld’s 2018 Men’s College Awards are presented by Spin Ultimate and the National Ultimate Training Camp. All opinions are those of the authors. Thanks for supporting the brands that make Ultiworld possible! The 2018 D-III Men’s Player of the Year was a unanimous selection amongst our staff for a spot on the All-American first team. A true hybrid able to dominate the game from both the handler space and with his athleticism downfield, Vickroy was the most well-rounded player we saw this season. One of the most underappreciated aspects of Vickroy’s game is his defense; while he didn’t always exert maximum effort on this side of the disc to conserve his energy for the tremendous load he carried on offense, Vickroy had a knack for stepping up and getting crucial blocks when his team needed them most. Villanueva may just have the most raw talent in D-III. He’s one of the best throwers in the division, and at six feet tall with tremendous length and exceptional athleticism, Villanueva is more than capable in the deep space on both sides of the disc. He showed a real ability to take over games this season, despite a tendency to be reckless with his decision-making at times. The rising senior is rumored to be playing with Johnny Bravo this summer; it’s scary to think about what a year of training and coaching at the elite club level will do for his game next season. The fact that Kenworthy is the only pure cutter on the All American first team is a testament to just how dominant he was at his position this season. The one word that comes to mind when watching Kenworthy cut is power; he blows by his defender with ease, whether that’s blasting past his man’s shoulder for an easy under or taking off to catch a deep goal. 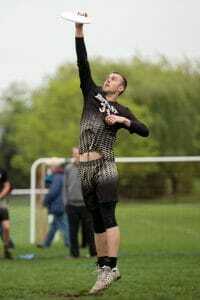 Kenworthy made several big throws this season as well, and his relentless energy on both sides of the disc was one of the driving forces behind Bryant’s run to the national title. The 2017 Breakout Player of the Year and 2018 Defensive Player of the Year is building quite the awards cabinet for himself. 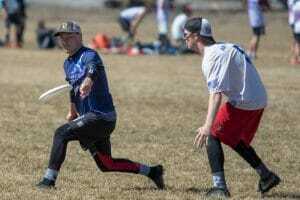 While certainly a star in the division, Chun-Moy’s playing style is far from glamorous, battling the toughest matchup defensively and making the boring, yet intelligent, decision with the disc on offense. While more than capable of making the spectacular layout block–like he showed in the championship game against Bryant–the testament to Chun-Moy’s talent is more about how often you don’t notice him on the field, taking his matchup completely out of the game. A rising senior, it’ll be interesting to see if Chun-Moy can add more to his growing resume in 2019. The 2018 Offensive Player of the Year was the conductor orchestrating Middlebury’s incredible offensive unit to a national semifinal appearance after failing to qualify for Nationals in 2017. Salzman does everything you could want from a handler, hitting the deep shot when it’s open and showing the patience to work the breakside and unders when required. 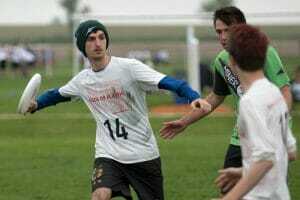 The rising senior is on Johnny Bravo’s roster for this summer; a summer of playing at the highest level of club ultimate should do wonders for helping Salzman round his game to become more impactful on the defensive side of the disc. Carleton GoP had one of the most unique and effective offenses in the country this season, and Abe Eichner was the center handler and leader of that unit. 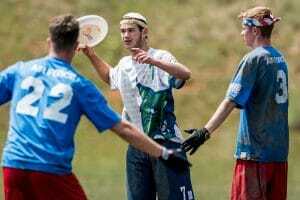 Eichner has the throwing ability of the other handlers on this team, but his playing style couldn’t be more different. An average athlete at best, Eichner is one of, if not the most, intelligent players in the division. His understanding of spacing and timing is second to none, allowing him to get open repeatedly against the most athletic of defenders. 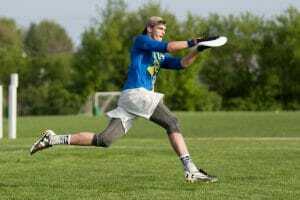 His ultimate IQ also makes him serviceable on the defensive side of the disc, where his awareness and anticipation make him a plus defender. A captain and leader in every sense of the words, GoP is going to miss Eichner’s impact on and off the field next season. While much has been made of Kenworthy’s dominance cutting this season, Cameron Jack’s throwing ability was just as, if not more, important to Bryant’s run to a national title. On a team filled with excellent athletes who are competent throwers, Jack stood out as the one truly exceptional handler on Craze. Standing at 6’2, Jack was able to use his height to see over and step around his mark, and his big, flat throws to space left Bryant’s quick cutters with little work to do on the receiving end. His height made him versatile in Bryant’s zone, filling in at all three levels at various points, but Jack spent most of his time in the cup, using his length to clog passing lanes and picking up the disc quickly to fastbreak on turns. While Kenworthy will certainly be missed next season, it’s Jack’s throwing ability that Bryant will struggle most to replace as they look to defend their title in 2019. After suffering a brutal loss in the game-to-go to Nationals last year, Norrbom returned to Mary Washington for a 5th year with the goal of finally pushing the program over the edge to its first Nationals berth. The lefty handler was instrumental to the team’s success and had a tremendous season, capped off by winning the Donovan Award. While a disappointing showing at Nationals kept him off the first team, Norrbom’s season and how it translated to Mary Washington’s success in accomplishing their team goal should not go ignored. It seems like every year at D-III Nationals, a handler with a high usage rate utilizes the big stage to display just how talented of a thrower they truly are. This year’s revelation was Occidental’s Adam Grammer. 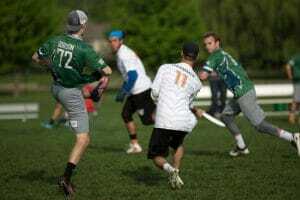 The Donovan nominee carried an incredible work load for Detox, serving as one of the few quality throwers on a team full of athletes, and Grammer showed his full repertoire of throws en route to leading the tournament in assists with 30 in just five games. Combine his performance at Nationals with his six assist, four goal performance in the game-to-go at Regionals, and Grammer was a no-brainer for an All-American spot. Whitman’s lefty handler was a pleasant addition to the division this season. Farwell is a terrific thrower, using his quick lefty flick to hit arounds with ease and launching big backhands the length of the field. Farwell is also a terrific defender, showing impressive lateral agility in the handler space. Farwell not only has all this talent, but he also has a sense for the moment, stepping up to make the big play when his team needs him the most. A rising senior in 2019, hopefully Whitman will elect to play D-III again next year so we can see how Farwell develops into his senior season. Bowdoin was one of the biggest surprises of the 2018 season. 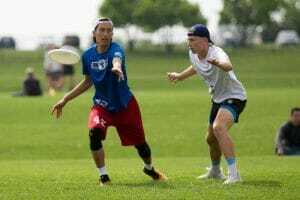 Starting the year outside of our Power Rankings, Bowdoin had an impressive season that ended with a loss in the quarterfinals of Nationals to the eventual champions. Leading the way for Clown was senior handler Max Vogel. Vogel’s numbers don’t convey the extent of his impact on the game for Bowdoin. On numerous occasions, Vogel would make the difficult throw and get the hockey assist, setting up his teammates for easy goals. While Bowdoin returns quite a bit of talent next season, they’ll need someone to step up and take the responsibility being vacated by the graduation of Vogel. The 2018 Breakout Player of the Year was an absolute force this season. Playing every offensive point and crossing over frequently to the D-line, DeLorenzo showed an impressive level of fitness and energy, playing more points than anyone else on Middlebury. The powerful cutter was fantastic in the air, and he would use the cushion provided by his defenders to catch big unders and hit continuations before a mark could get set. The next step for the rising junior’s growth is to become more consistent; decision-making and spurts of turnovers kept him off the first team this season. On a team with just nine players, everyone is asked to carry a heavy load. For John Brown, Grant Bruner bore the most responsibility with the disc, and he handled his duties with aplomb. 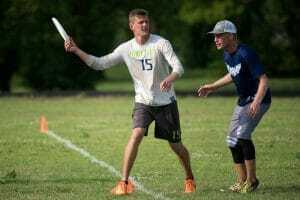 The tall handler has a full repertoire of throws, capable of hitting inside and around breaks, upside-down throws over the top, and both flick and backhand hucks. Bruner’s throwing ability gave John Brown plenty of quick holds, which were essential to conserving the short roster’s legs. While Bruner’s defensive ability kept him off the first team, his impact and abilities on offense made him more than deserving of a spot on the second team. 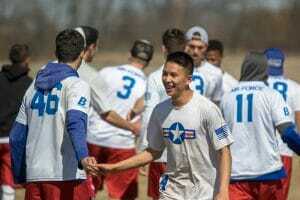 The Lost Boys of North Park came into Nationals with little fanfare, qualifying out of a relatively weak region in the Great Lakes and not notching any major regular season wins. They came within one point of qualifying for the quarterfinals, thanks in large part to the athletic dominance of Drew Swanson. 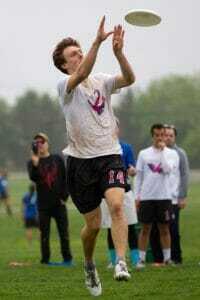 The 6’5 senior could not be stopped in the deep space, seemingly winning every disc he went up for. 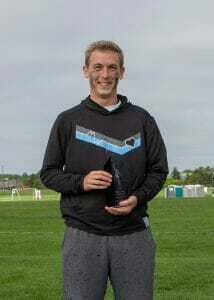 His performance in North Park’s prequarters matchup against Whitman was one of the best individual efforts of the tournament, notching eight goals and two assists in the Lost Boys’ 12-11 loss. 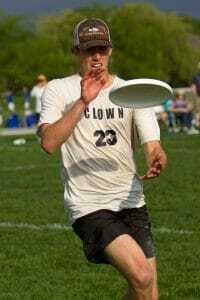 Comments on "D-III Men’s 2018 All-American Teams, Presented by Spin Ultimate & NUTC"